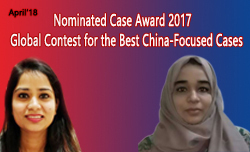 The ICFAI Business School case 'TECNO Mobile's Growth Strategies in Africa' by Syeda Maseeha Qumer and Geeta Singh won a nominated case award at the 2017 Global Contest for the Best China-focused Cases. The case is about China’s TECNO Mobile's success in Africa and its expansion into other global markets. TECNO emerged as the undisputed leader in Africa’s mobile phone industry by offering innovative and high-quality products specifically geared to the African market at an affordable price. Its success highlights how a small Chinese company was able to win the African market through accurate brand positioning, appealing product portfolio and effective localization. The other winners are from China Europe International Business School, Xi’an Jiaotong University, Shanghai University of Finance and Economics, Zhejiang University and Hong Kong Polytechnic University.